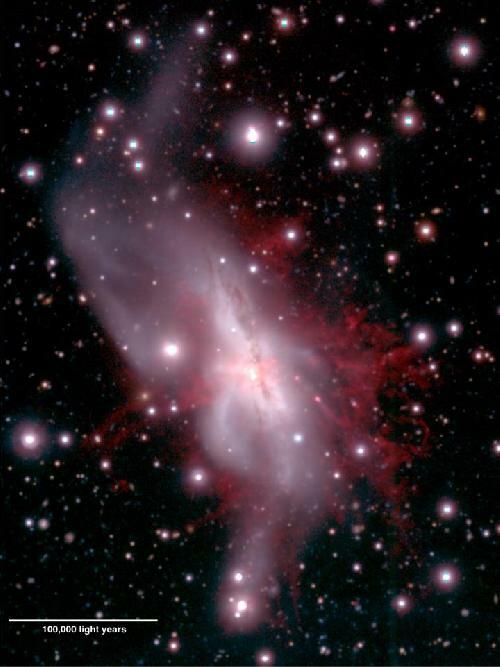 An international team led by a researcher from Hiroshima University has succeeded in revealing the detailed structure of a massive ionized gas outflow streaming from the starburst galaxy NGC 6240. The team used the Suprime-Cam mounted on the 8.2-meter Subaru Telescope on Maunakea in Hawaii. The ionized gas the astronomers observed extends across 300,000 light-years and is carried out of the galaxy by a powerful superwind. That wind is driven by intense star-forming activity at the galactic center. The light-collecting power and high spatial resolution of Subaru Telescope made it possible to study, for the first time, the complex structure of one of the largest known superwinds being driven by starbirth - and star death. NGC 6240 is a starburst galaxy fairly close to the Milky Way, at a distance of about 350 million light-years. Its SFR is estimated to be 25-80 times that of our galaxy. It has a peculiar, disturbed morphology which indicates that two spiral galaxies are merging. Due to the giant starburst at its heart as a result of the merger, NGC 6240 is very bright in infrared light being emitted from heated dust. The total infrared luminosity reaches almost a trillion times of that the Sun's. Their unprecedented deep observation (long-exposure images) revealed a complex giant ionized gas nebula (called an "H-alpha nebula") surrounding NGC 6240. This nebula extends out about 300,000 light-years and contains complicated structures of filaments, loops, and blobs. Astronomers knew that such a large ionized gas nebula surrounds NGC 6240, but the depth of the observation significantly surpassed any previous studies and first allowed the Hiroshima team to study the some of the faintest, most detailed structure of the nebula. Large "broken bubbles" were detected in the northwestern and southeastern parts of the galaxy. These features are the evidence of a past energetic bipolar-shaped superwind that blew along the minor axis of the main galaxy disk (orthogonal to the main galactic disk).